For all landowners lamenting the dearth of coconut pluckers, or padekars, and the plight of their coconut plantations, the solution to the problem is a just a click away now. Suprajit Raikar, a resident of Benaulim, has taken a leap of faith, moving from a lucrative profession in the sphere of IT and starting his own business called Padekar.com. The coconut is a staple in the diet of any Goan, be it the famed fish curry or delicacies for a sweet tooth such as doce, dodol, baath, etc. A quintessential Goan meal without the addition of coconut in some form or the other is unthinkable. 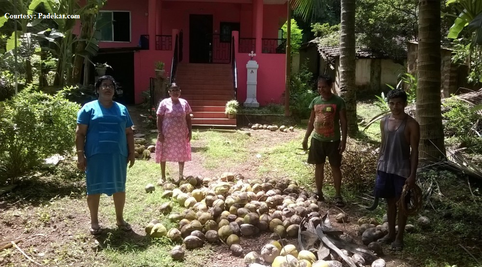 Nevertheless, recent years have seen a serious decline in the number of coconut pluckers available to carry out the harvesting of tender and ripe coconuts. Suprajit was the president of the NGO DMD (Desi Motorcycle Diaries)-Youth Adventure Club when he became aware of the plight of the coconut pluckers. ‘It was a natural switch over to move from IT to Padekar.com,’ says the thirty two year old entrepreneur who is clearly earnest in his desire to bring about a change in society. He has brought over his IT acumen to his company to enhance its position. The moment of reckoning that convinced Suprajit that something needed to be done about the situation was his cousin suffering grievous injury due to a coconut falling on his head. The company came into existence in February 2015 after he made contact with local padekars and the Coconut Development Board situated at Kochi, Kerala. There are bhatts, or coconut plantations, which have been converted to residential areas and bhatkars, or landlords, have moved away from their homeland. This has decreased the number of plantations the padekars could be employed to work in. This, however, is not the only issue as there are landlords and plantation owners who still have a need of these workers. ‘One thing I realised being in the IT field is that no one will join in unless money is given – and this is true of any area,’ says the post graduate from Gogte Institute of Technology, Belgaum. He applied this logic to rope in coconut pluckers by offering them a reasonable wage of Rs 45-60 per tree (depending on the number of trees). More than 15-16 workers have registered with the company. It is obvious that the company is on the lookout for quality and not quantity. The landlords, who need only to fill an online booking form to avail of their services, can rest assured that the padekars they employ are skilled at their job and reliable. This is particularly important with regard to coconut pluckers in the Salcete region because the problem is more pronounced there. In North Goa padekars charge Rs 100 and more per tree and are more secure in terms of payment. Padekar.com, however, provides services at Rs 45-70 (depending on the number of trees) in the other talukas, making it more feasible for the landlords. 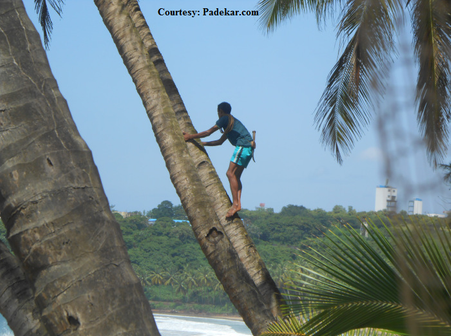 Offering more than a fair wage, Padekar.com goes further by giving coconut pluckers who register with them a package of free homeopathic treatment and an entitlement to Rs 5 lakhs of insurance as benefit for undertaking the perilous task of climbing the towering coconut trees. Another affiliated project in the pipeline is an institute to train future padekars, but that has to be approved by the Coconut Development Board. Skills in traditional methods will be imparted as opposed to the use of machinery which, according to Suprajit, does not work in Goa owing to the greater height of the coconut trees here. The traditional method would involve a rope harness called a khaddum and notches cut into the tree with a koito (machete). The Government’s help will be a much welcomed move to initiate and carry through this training enterprise. The institute will have former padekars with twenty years of experience as teachers. This will give jobs to retired coconut pluckers, since they can no longer climb after the age of 50-55 years, and they can pass on the wealth of their experience to the younger generation. Already a small group based on these lines has begun functioning in Morpilla. ‘The whole process will take some time,’ says the enthusiastic Suprajit who has plans to launch the company’s own brand of virgin coconut oil soon. Please Note: The coconut pluckers can be contacted and hired directly through the booking form on the Padekar.com website.